At the Restaurant – Pizzeria Al Mulino you can enjoy a variety of traditional Emilia-Romgna dishes prepared with all the passion and dedication that has always distinguished our cuisine. 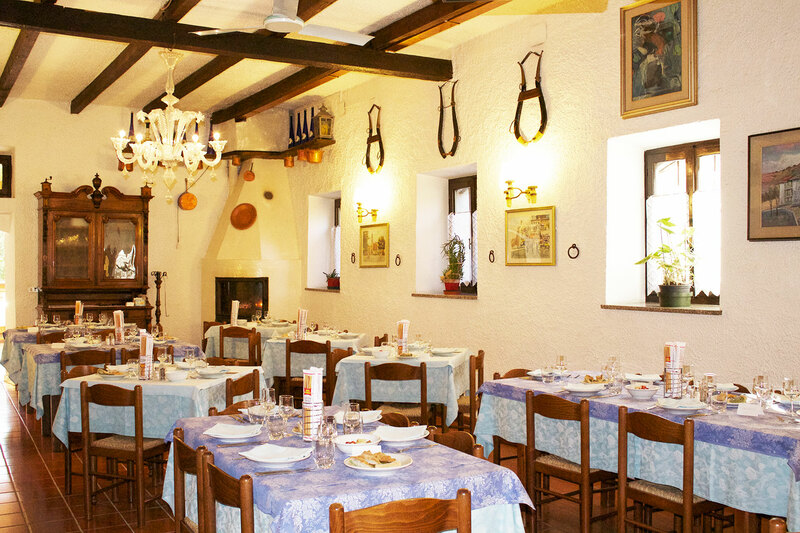 The typical dishes of the area are accompanied by a selection of pizzas cooked in a wood-fired oven. 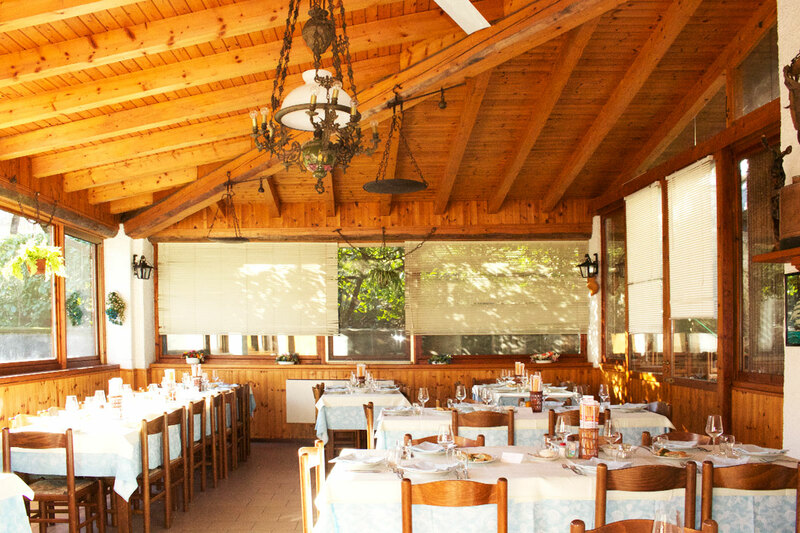 The dishes are served in spacious and comfortable dining rooms furnished with a taste that recalls the same old traditions that since 1980 continue to inspire our culinary choices. The restaurant has a comfortable indoor dining room and a delightful veranda that all together have a capacity of 120 seats. Our bright veranda is highly recommended and always available for group lunches or dinners, parties and banquets. For those who love eating outdoors, we provide 20 seats where you can taste our dishes wrapped in the natural context in which our restaurant is nestled. This is how an experience full of the best flavors of Italian cuisine is combined with the pleasure of moments spent in the comfort and warmth that characterize the dining rooms in which we welcome our guests. In addition to the indoor hall, the veranda and the outdooor space, at the Restaurant Al Mulino you can also spend pleasant moments in our bar, a friendly and familiar environment where after lunch or after dinner you can have a coffee or a digestif. We remind our guest that our Restaurant offers a practical Wi-Fi connection available whenever you want. We also guarantee an easy access for guests with disabilities. Passion, attention and dedication are our strength in the kitchen. Tastiness, freshness and faithfulness to tradition are the promise that we are committed to keep with all the most demanding palates that we will have the pleasure of welcoming in the comfortable rooms of the Restaurant – Pizzeria Al Mulino. Born from years of experience in the field, we dedicate our cuisine to all lovers of the best Italian culinary tradition as an experience that aims to satisfy different tastes thanks to a wide range of carefully selected dishes that includes traditional cold cuts, homemade first courses and second courses based on meat or fresh fish. Moreover, our homemade bread and our exquisite pizzas cooked in a wood-fired oven are prepared with naturally leavened dough. The manufacturing of pork for the production of Ham, Coppa, Salami and Pancetta reaches its excellence thanks to the knowledge handed down since ancient times on the territory of the province of Piacenza. As tradition suggests, you can accompany the local seasoned cured meats with our Fried Gnocco prepared according to the original Piacenza recipe. True masters of the artisanal dough, the Mulino‘s chefs express their culinary art also in the creation of an assortment of first courses based on handmade pasta. Tortelli, Ravioli, Pisarei, Chicche della Nonna, Gnocchi and Malfatti are all prepared exactly as they once were, to offer you the true ancient flavors of traditional cuisine. With attention to what every season generously has to offer, we love to bring to the table different types of Game Meat like Wild Boar and Deer prepared according to recipes designed to enhance the intense and characteristic taste. Faithfully to the Italian tradition, we accompany our dishes based on Wild Game with our handmade Polenta. Great symbol of Italian popular cuisine, the true traditional Pizza could not miss in our menu. Our Pizzas are prepared only with naturally leavened dough, which together with the baking in wood-fired oven, contribute to give crunchiness and fragrance to our delicious assortment of handmade Pizza. The Restaurant Al Mulino is not only dedicated to preserve with passion the traditions of the typical cuisine of Piacenza, but also to offer a selection of starters, first courses and second courses with fresh fish that our expercienced chef prepares using different types of cooking to delight fish lovers with refined and diversified proposals. Starting with the classic Impepata di Cozze (Mussels with Pepper), with the delicate Greater Amberjack and Salmon Tartare, or with the timeless Tagliolini with Lobster, and ending with a tasty Grilled Gilthead Bream, our fish dishes are both traditional and fine. The fish menu changes depending on the availability of the fish.. Since we are located in the heart of Val Tidone, we have paied attention to the excellence offered by the wineries in our area: this is how a generous list of wines was born, all in the name of both regional and Italian tradition, ready to offer you a selection able to delight every palate and meet every dish. The social cellars of Borgonovo and Vicobarone, together with the labels of Tenuta Colombarola, of Maria Poggi Azzali and of Podere Gaiaschi, without forgetting some wines of Oltrepò origins, are our first choice in the assortment of our cellar, to which we add a careful selection of National Labels from different Italian regions to accompany your dishes.